The Scottish first minister said Saturday that Scotland will launch immediate talks with the European union nations and institutions to find a way to remain in the bloc despite Britain's vote to leave. The country voted strongly to remain in the 27-nation bloc and the outcome of Thursday's vote is re-igniting the question of Scottish independence. Embattled Prime Minister Theresa May was scrambling Sunday to win over adversaries to her Brexit withdrawal plan as key Cabinet ministers denied media reports that they were plotting to oust her. May spent the afternoon ensconced in a crisis meeting at her country residence Chequers with fellow Conservatives and outspoken Brexit advocates like Boris Johnson, Jacob Rees-Mogg and others who would prefer to leave the European Union without a divorce deal rather than delay Britain's departure from the bloc further. Her office released a statement afterward giving no hint about whether she had gained any new backing. It said only that they discussed "whether there is sufficient support" to bring her Brexit divorce plan back to Parliament for a third vote. The prime minister has found her authority weakened after a series of setbacks in Parliament and her inability to win meaningful concessions from EU leaders who refuse to sweeten the Brexit deal. The Sunday Times claims that 11 Cabinet ministers plan to tell May to resign so a caretaker leader can be put in her place to kick start the stalled Brexit process. She faces growing pressure from within her own party either to resign or to set a date for stepping down as a way to build support for her Brexit plan. The confrontation may come to a head at a Cabinet session expected Monday. Under Conservative Party rules, May cannot face a formal leadership challenge from within her own party until December because she survived one three months ago. But she may be persuaded that her position is untenable if top Cabinet ministers and other senior party members desert her. Despite headlines about a Cabinet coup, there was no indication from Downing Street on Sunday that a resignation was near. 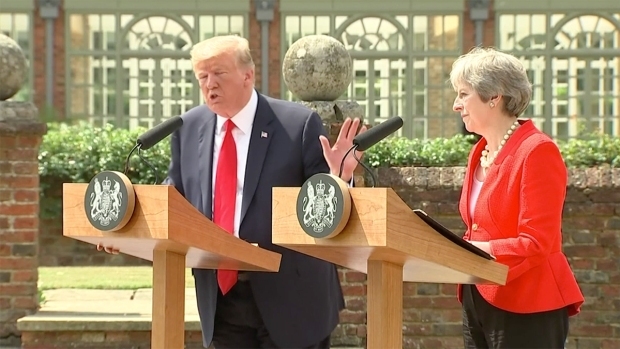 Two of the people mentioned as possible successors — Cabinet Office Minister David Lidington and Treasury chief Philip Hammond — expressed strong support for May. Hammond said Sunday that senior party members plotting to oust May were being "self-indulgent." He said a change of leadership would not provide a solution to the U.K.'s political deadlock on Brexit. "We've got to address the question of what type of Brexit is acceptable to Parliament, what type of way forward Parliament can agree on so that we can avoid what would be an economic catastrophe of a no-deal exit and also what would be a very big challenge to confidence in our political system if we didn't exit at all," Hammond said. Lidington, mentioned as a possible caretaker prime minister should May be ousted, said Sunday that talk of a Cabinet revolt was far-fetched speculation. He said May is doing a "fantastic job" and that he has no desire to take her place. Still, May thus far has been unable to generate enough support in Parliament for the deal her government and the EU reached late last year. Lawmakers voted down the Brexit plan twice, and May has raised the possibility of bringing it back a third time if enough legislators appear willing to switch their votes. The Cabinet is focused on the best way to get May's withdrawal plan passed in the House of Commons, Lidington said. The U.K.'s departure from the EU was set to take place on March 29, but the absence of an approved divorce agreement prompted May last week to ask the leaders of the 27 remaining EU nations for a postponement. 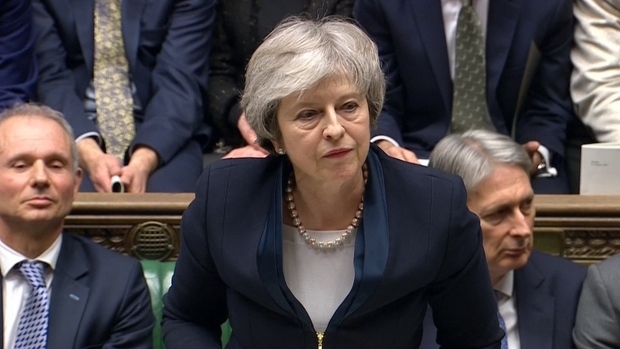 The leaders agreed to delay Brexit until May 22, on the eve of the EU Parliament elections, if the prime minister can persuade Parliament to endorse her twice-rejected agreement. 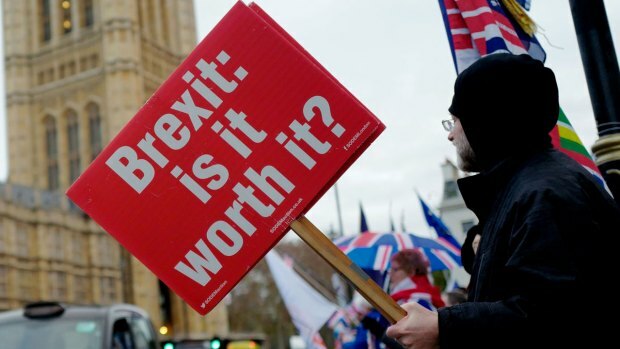 If she is unable to rally support for the deal, the European leaders said Britain only has until April 12 to choose between leaving the EU without a divorce deal and a new path, such as revoking the decision to leave the bloc or calling another voter referendum on Brexit. Parliament may hold a series of votes this week to determine what Brexit proposals, if any, could command majority support. Conservative Party legislator George Freeman, a former policy adviser to May, tweeted that the U.K. needs a new leader if the Brexit process is to move forward. "I'm afraid it's all over for the PM. She's done her best. But across the country you can see the anger. Everyone feels betrayed," Freeman tweeted. "This can't go on. We need a new PM who can reach out &amp; build some sort of coalition for a Plan B." May also faces pressure from groups demanding a second Brexit referendum. Huge crowds turned out Saturday for an anti-Brexit protest march in London, which organizers claimed involved more than 1 million people. On Sunday, an electronic petition designed to cancel Brexit altogether passed the 5 million signature mark.